I am a staff writer and editor for Mother Nature Network’s site From The Grapevine. Here’s the archive of my blog pieces and articles. Also, I wrote a journal about adopting a baby for the New York Times Motherlode blog. Here are those entries. I also write other articles for the Times, similar to this one. Besides starting a new website, I’m writing about TV once per week for Parade’s website. You can find my Parade.com posts here. A “New” Antenna Free TV! I can’t really call this “new” because it’s been in place since May, but if you haven’t seen my site Antenna Free TV lately, you really need to go over there. Yes, the podcast is still there, as it’s been for over two years now. But I’ve partnered with some great entertainment journalists — Mike Moody, Mekeisha Madden Toby and Will Harris — and have built a whole new experience, with daily essays on TV, plus musings from some great writers we’ve brought on board. So take a look and let me know what you think. I’ve had some fun over the last couple of months writing for Fast Company’s Co.Create site, mainly because I can put a spin on my usual celebrity and producer Q&As. 2012 Fun: NY Times, AV Club, Vulture, etc. Over the last few months, I’ve been making contributions to the “Chat Room” feature on New York Magazine’s Vulture Blog… and not all of them have been about Breaking Bad! You can find my posts here. A new podcast is in town — Antenna Free TV! Ok, a few weeks ago I referred to a big surprise that was coming. Of course, it wasn’t on the level of a big spoiler or anything; all anyone had to do to find out what it was was to ask. But what I decided was that the old TV Squad podcasts I used to do were so much fun that I wanted to start them up on my own. So with the help of Jason Hughes, who was my usual co-host on those old Podcasts, we’ve started Antenna Free TV. For now, the new site will only contain the podcast; any musings by me or anyone else about TV can be found there (of course, I still get paid to muse about TV, but it’s just scattered a bit). The plan is for Jason and I to do the podcast weekly with someone from around the TV landscape, whether they’re a fellow critic, someone who manages a fan site, or maybe even a few people who work on actual TV shows. One thing is, though, we’re going to shoot the breeze and generally try to have fun while we record the thing. The first official podcast is up; you can either listen to it here, download it via this link, subscribe to the RSS feed, or subscribe via iTunes. 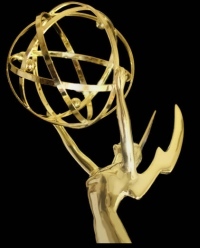 Even though I’m no longer with AOL TV, I’m still writing about TV, especially during the all-important “Emmy speculation season.” In fact, I’ll be blogging about the Emmys for Zap2It right through the September 18 ceremony. Read Zap2It’s Emmy coverage, including my posts. You can read my posts here. I decided to freshen things up a bit around here with a new theme, a new color scheme, and a social networking toolbar at the bottom of the screen (UPDATE 6/20/11: I decided to change that to social networking buttons, which you can find right under my smiling mug on the top right). More surprises coming, including new links to more recent published pieces and… well, I’ll let you know about the big surprise when it happens. Stay tuned!